You can use various Rotala plants like the Rotala Wallichii to adorn your aquarium. It creates a visual that will make every hobbyist more imaginative and creative. Ideally, your well-decorated aquarium would exude relaxation through simple methods of ornamentation. But before doing so, you must, of course, take care of the living creatures in the tank. Rotala Wallichii was named by a Swedish Botanist Carl von Linné, also known as Carolus Linnaeus in the mid-17th century. Scientific findings indicate that this species comes from genus Rotala and the plant family Lythraceae. It is comparable to the family of purple loosestrife, which is also a flowering amphibious plant. It is a creeping herb with prominent spikes that develop purple and pink flowers along its color-changing stems. 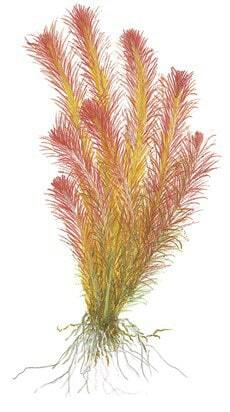 Rotala Wallichii existed in Asian tropical waters, along China, India, Laos, Thailand, Vietnam, and Taiwan. The red-stemmed "bunch plant" is rare and fragile. It was later introduced to the USA and now being distributed worldwide especially in the Dutch and Scandinavian territories. This emersed aquatic foliage can thrive standing out of or rising above the surface of the water. We can also find them in a submerged state in moist areas like shorelines and rice paddies in Southeast Asia. We also know this wine-colored plant as Whorly Rotala, which is Rotala Wallichii's other known familiar name. It is a stem plant that yields flowering spikes. Dependent on the light, its delicate leaves are a combination of red and brown, but can turn to purple or pink. This demanding herb can grow as long as you provide the best nutrition and care, especially in pruning and replanting into the substrate. You should apply extra care when doing these processes because this species of plant is delicate to handle. The Whorly Rotala varies in colors and structure depending upon illumination and growing circumstances, and are characterized as submersed plants than pure aquatic. Notably, its emersed state on terrestrial habitats possesses thicker and rounded leaves. In contrast, the submersed form has a narrow and lanceolate leaf shape. Habitats can be seasonally rotated from emersed to submersed, or vice versa. In doing so, you will experience unique distinctive results. It can grow to an average height of 10-15 inches (35-40 centimeters). The stem width can reach 2-5centimeters in two months after its planting. Be patient enough to take care of all the living organisms in your tank, and in turn, you will be rewarded with a soothing and relaxing sight. Take care of the plants in the same way you take care of the fish. Tank decorations are meant to look orderly, but aggressive fish behavior can easily disrupt that. So when it comes to re-arranging, patience is the key. You must also proceed with a little caution and not cause the water in the tank to go blurry. Rotala Wallichii can be placed either in a smaller or bigger tank and do not thrive invasively. No need to worry about crowding your tank upon missing a regular pruning. Well-Balanced fertilization adds up in its abundant growth, which is why tank filtration should be functioning well. Do this regularly to minimize algae and other elements that can hamper the lives of your fauna and foliage. Enough injection of carbon dioxide of around 15 to 25mg per liter of water. Make a habit of checking the consistency of the water in your tank. If the water is soft, the delicate leaves can easily clog together, even the dead particles. They won't be floating on the surface and turn the clear water messy and blurred. For this Rotala species, the recommended light should be above 0.5 watts per liter of water or 2 watts per gallon. This is strong enough to display the leaves' reddish brown color turning purple and pink. A pink-colored top is more pleasing to the eyes than all red stems. The deciding factor for hobbyists is to see their Rotala Wallichii bloom in vibrant coloration. It will be very rewarding to see the fruit of your time, money and effort. Some plants like Rotala Wallichii should be planted in groups in the middle part of the tank. It is your choice if you prefer to disperse them evenly at the back. You can achieve the optimum effect when you scatter them along the background. To create a bushy appearance, place a cluster in the mid portion and a group of stems on one side of the tank. Make sure to balance the other side with the same stem plant of the likes. The plant is perfect for decoration because of its red-colored shoot tips radiating within light's effect. You can always add a dramatic effect using other decorations like stone figurines, driftwood, aside from aquatic plants. When it comes to planting, each seedling should have a distance of 2 to 4 centimeters apart from each stem. This is to avoid them from growing closer to each other and build up algae. It can also be placed in the tank’s rear window at a 70-degree angle. Depending on your arrangement, pruning should be regularly done to control its denseness. Trim the upper portion of the plant at about five (5) centimeters. Let the cuttings fall off the ground or on its substrate to give way to new stalks to grow. Large trimmings can be planted individually in the substrate using a tweezer. You should have specialized cutters, tweezers and other tools to facilitate an effective pruning and replanting. This is how the propagation process takes place. Aquascaping aims to create art underwater, therefore, you should always consider the technical aspects. It ranges from the maintenance of the aquarium, illumination and growth requirements of every fish and plants. Unfortunately, plants like these are a common target of invertebrates and fish. You will have to choose the appropriate fauna for your type of aquarium. By now, you should already know how to balance decorations in your tank. The arrangement is a collaboration of all living things within that is simple yet beautiful in its totality. Every plant you buy in the aquascape trade comes with enough care instructions, hints and tips. A lot of species also come in photographed emersed, submerged state, even in nanoforms and vitro cups. This is to differentiate a true comparison, which time and again, is proven to possess unique properties. This procedure is solely based on temperature adaptability, habitats, and the environment. Rotala has several well-known variants. Because of its fine filigree feathery leaves, Rotala Wallichii became popular and is regarded to be the most beautiful in the Rotala species. Upon the striking of light, this thin stem plant oozes out a display of vibrant colors in hues of green, brown, red to purple and pink. This characteristic primarily attracts the onlookers, plant lovers and otherwise. Of high demand track record, Rotala Wallichii is a perfect addition of an aquatic plant to your new aquarium. The choice is for you to decide which Rotala species is best to visually fascinate.